If you know of any other great Cinematography websites, blogs, or groups, please email us and we will add them to the site. Comparative tests from several modern cameras: Epic, Alexa & more, based on dynamic range, skin colour representation etc. A great resource site for cinematography, with tools, tips, and techniques. A forum on Cinematography led by world renowned Cinematographer Rodger Deakins. John Brawley is highly experienced Cinematographer. His blog is very informative and helpful for upcoming Cinematographers. StudioDaily discusses shooting workflow, developments, product releases and emerging projects. They focus on craft and workflow innovation in the production of movies, TV shows, commercials and music videos. The American Society of Cinematographers Blog has a lot of in-depth discussion on Cinematography and Cinematographers. 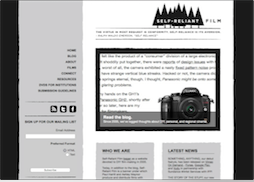 Self-Reliant Film began as a website devoted to DIY film-making in 2005. Today, in addition to the blog, Self-Reliant Film is a banner under which Paul Harrill and Ashley Maynor produce films. Shane Hurlbut is a leader in the DSLR filmmaking movement. His blog shows an interesting perspective on Cinematography with some great technical advice.